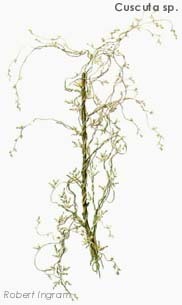 Dodder is a common name attributed to many plants. The true dodder (Cuscuta spp.) is rare in Tasmania. The plant more commonly referred to, as dodder that swamps the canopies of many native trees is the native plant Cassytha melantha. 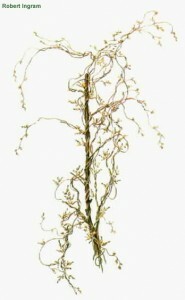 Growth Habit: Dodder has thread-like stems that are green to yellow. It has no leaves. It attaches itself to a host plant through suckers. It produces a mass of stems in the canopy of the tree, eventually overcrowding the tree and killing it. 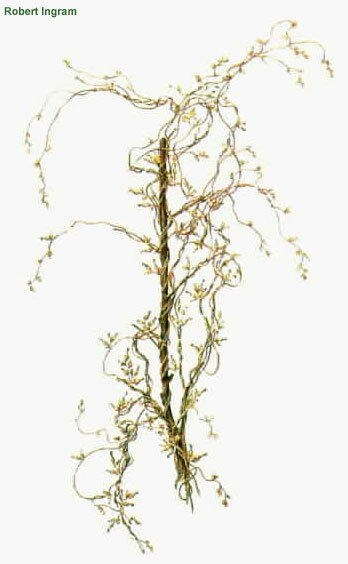 Type of Plant: Dodder is perennial parasitic plant. Flowers: The flowers are small and occur in dense clusters. Fruit/Seed: Small green berries ripen to red, then release several sticky seeds. Dispersal: Birds eat the sticky ripe fruits, later passing the seeds in other trees. Status: Dodder is a declared weed in Tasmania. Capable of dominating the canopies of trees, and eventually killing them. Regarded as a weed by some land owners, however it should be remembered this plant is a native of Tasmania. Physical Removal (all year). Remove all stems by hand from infested plants. Regularly check for new shoots. Herbicide. No herbicides are able to kill the weed without killing the host plant.